Second wave. Shot down on outward flight and crashed into sea. Arthur Neville Whitaker, known to his family as Neville, was born in Blackburn, Lancashire on 8 September 1909, the son of James and Edith Whitaker. He went to Blackburn Grammar School and then studied accountancy. After qualifying as a chartered accountant, he went to work for a firm of musical instrument dealers in Blackpool. When the war started, shortly before his 30th birthday, he enlisted in the army, joining the local Blackpool Regiment but then in May 1941 he switched to the RAF. After training at Air Observers School he qualified as a bomb aimer. He was posted to 467 Squadron about the time of its formation in early November 1942 and was crewed up with pilot Sgt Herbert Vine. Charles Jarvie was also allocated to this crew. Sgt Vine appears to have had a somewhat chequered career, and had been cautioned for low flying. On one occasion, ground crew had to remove foliage from his undercarriage. The Vine crew’s first operation was the usual “gardening” (mine-laying) operation in the Deodars area on 12 January 1943. Whitaker flew with Vine that night and on five further missions, the last being the bombing of Lorient on 16 February. At that point, a straight swap of two crew members between Vine’s crew and the newly arrived crew of Vernon Byers took place. Bomb aimer Whitaker and mid upper gunner Jarvie were exchanged for Sgt John McKee and Sgt Robert Haslam repectively. Why this happened remains something of a mystery. It was a bad move for McKee and Haslam since on their very first operation with Vine, on 19 February, they fell victim to a German night fighter and crashed into the North Sea. Conversely, it bought a few months more for Whitaker, and he went on to fly with the Byers crew on the three operations which they flew in 467 Squadron on 9, 11 and 22 March. On 28 March, they were posted as a complete crew to 617 Squadron. The Byers crew seemed to have impressed in training for the Dams Raid, and were selected to attack the Sorpe. 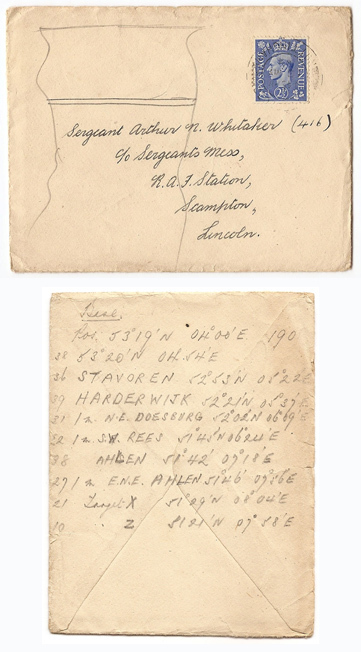 At the briefing for bomb aimers and navigators on the afternoon of Sunday 16 May 1943, Whitaker wrote down some of the key route co-ordinates on the back of an envelope, perhaps before transferring them to an official log for the flight. The envelope was found in his personal effects when they were sent to the family after his death. 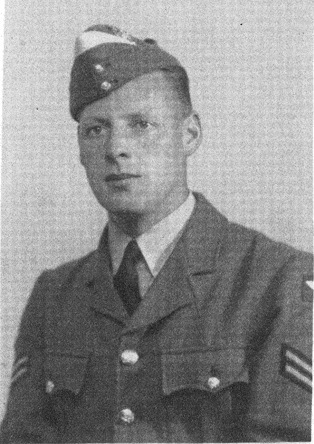 Neville Whitaker died when AJ-K was hit by flak just after it had passed over Texel island on the Dutch coast. Like five of his colleagues, his body was never recovered and he is commemorated on the Runnymede Memorial. Thanks to Gary Whitaker and Alex Bateman for their help with this article. Fascinating and interesting to read of my mother’s cousin who shares a name with her father, Arthur Whitaker. We recently ( April 2017 ) visited Petwood Hotel Woodhall Spa and looked at photos of 617 Squadron as part of a weekend to celebrate our mother’s 95th birthday.